Boiled Potatoes: 2 Medium Sized. Blanched Corn, Green Peas: 1/2 Cup each. Finely Chopped Capsicum: 2 TbSpn. Finely Chopped Onion: 2 TbSpn. Chopped Coriander Leaves: 1 TbSpn. Ginger Garlic Paste: 1 TbSpn. Green Chilly Paste: 1 TbSpn. Black Pepper Powder: 1/2 tspn. Tomato Catch up: 1 TbSpn. Grate boiled potato in a bowl. Add left over rice, green peas, corn, onion, capsicum to it. Add ginger garlic paste, green chilly paste, crushed black pepper, salt chat-masala, lemon juice and coriander leaves to it. Mix it well. Make equal sized fritters from it. Heat oil in a pan, put all fritters into pan and sauté them till golden brown both the sides. 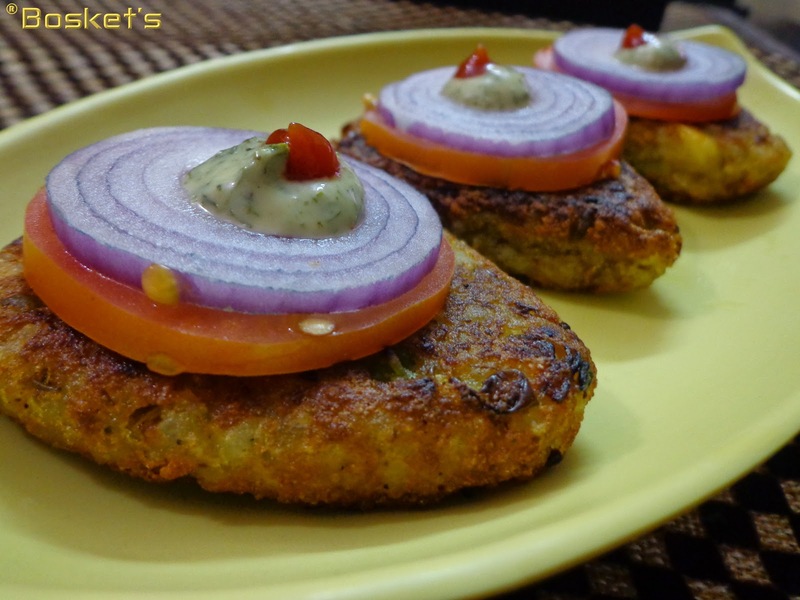 Garnish all fritters with onion and tomato slices on the top of them, followed by a drop of mint mayonnaise and tomato catch up.